Each test strip tests for 11 different parameters. Each parameter tests for different substances in the body. The colours on the strip change based on your urine, see below for a further understanding of each parameter. DEHYDRATION TEST – Test and see whether you are drinking enough water. GLUCOSE TEST – Normally, your urine should not contain any glucose. The presence of glucose may suggest a problem – consult your doctor. PROTEIN TEST – Normally, your kidneys pass only a small amount of protein through their filters into urine. If you detect protein in your urine, you should consult your doctor. VITAMIN C TEST – Excess vitamin C is excreted in urine. If you are taking a vitamin C supplement and detect it in urine, your body has more than it needs. PH LEVELS TEST – A measure of acidity or alkalinity in the urine. WHITE BLOOD CELLS TEST – The detection in your urine of white blood cells may indicate a problem – consult your doctor. 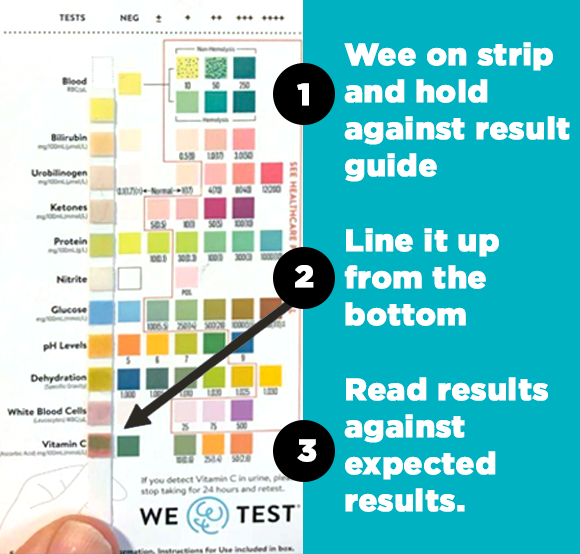 NITRITE TEST – If you detect any nitrite in your urine, it may indicate a problem – consult your doctor. KETONES TEST – The presence of ketones in the urine may indicate a problem – consult your doctor. BILIRUBIN TEST – The presence of bilirubin in the urine may be an indicator of a problem - consult your doctor. UROBILINOGEN TEST – The presence of urobilinogen in the urine may be an indicator of a problem - consult your doctor. BLOOD TEST – A number of causes can lead to blood being passed in your urine, consult your doctor. No need to be sending away samples, just privacy and results in your own home, in just 1 minute.